(1) Users participated in one of our Charity Competition Events and purchased a monthly membership to experience BOUNCE as part of the fundraiser. (2) Users were provided a FREE Trial Membership as introduced from an organization they were affiliated with. In either case, if you're interested in becoming a BOUNCE Member full-time to support your local organization, you're at the right place. - BOUNCE Members that purchase a monthly $20 membership will automatically receive two (2) $10 Mobile Gift Vouchers (via text message) on the 1st and 3rd week of every month. BOUNCE features a different partner retailer every two weeks for our members to redeem their vouchers. "You pay $20... You receive $20!" 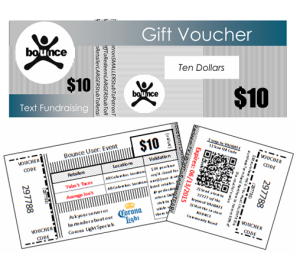 - As a BOUNCE Member you are also eligible to play our BOUNCE TEXT2WIN for a chance to win an additional $50 Mobile Gift Voucher. - The bi-weekly TEXT2WIN is optional and only available to paid members, as the chance of winning is 1 in 15 for every member that plays. Members will receive a TEXT notification on the 2nd and 4th week of every month with instructions on how to play. - 30% of the collected subscription fees are donated back the the organization that is associated with an individual's account. Want to see how it works on your mobile phone? REFUND POLICY: It's fairly simple. You return your purchased vouchers and we'll refund your money. No questions. Since you paid $20 to receive $20, simply do not redeem your non-expired $10 vouchers, and we'll refund your money. This refund policy does not apply to winning vouchers from our weekly Text2Win program. Also, at any point in time that you want to cancel your recurring membership fee OR receive a refund, simply log into your member account and use the provided form. BOUNCE WALLET collects the membership fees on behalf of each participating organization. BOUNCE WALLET owns this proprietary technology and administers these platforms to ensure ease of use for our organizations.